So ends another great year of Pat Sloan’s mystery BOM. 2015 was the year for long summer vacations, immortalised in blocks depicting the fun things we see and do on vacation. I decided to deviate from the pattern a smidgen (that is the rebel in me) and add the psychedelic and hypnotic wavy print from Weeds by Me and My Sister Designs for Moda. It creates a great effect as if the fabric is moving. I was getting woozy as I was cutting the sashing and borders. 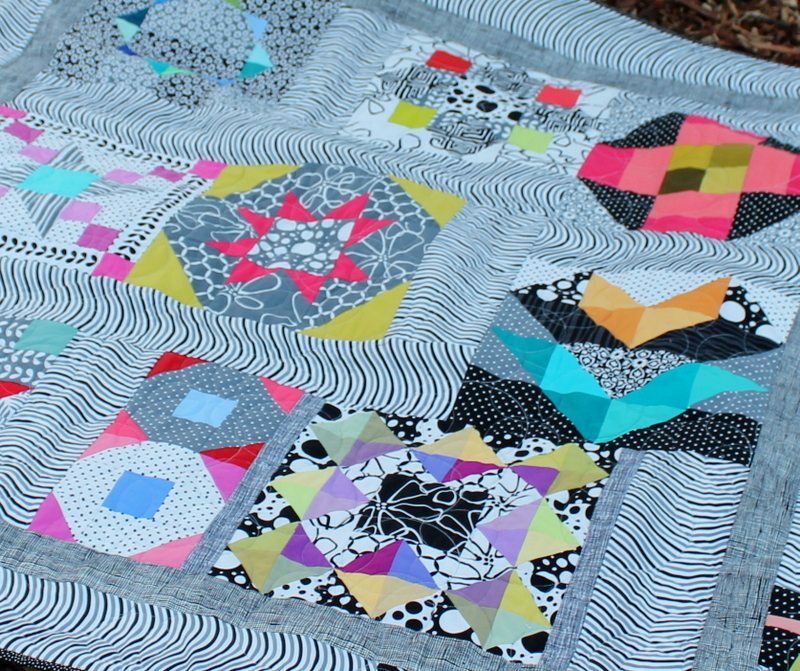 The blocks are a combination of charm pack solids from Moda and Michael Miller collections teamed with another Me and My Sister Designs collection called Shades of Black. Shades of black have an interesting mix of small, medium and large prints which made excellent backgrounds to the stark contrast of the solids. The quilt is finished in Aurifil 2600 50wt cotton ( because I am in love with Dove ) using an all over bubble pattern. All the details for the 10 month BOM can be found here. 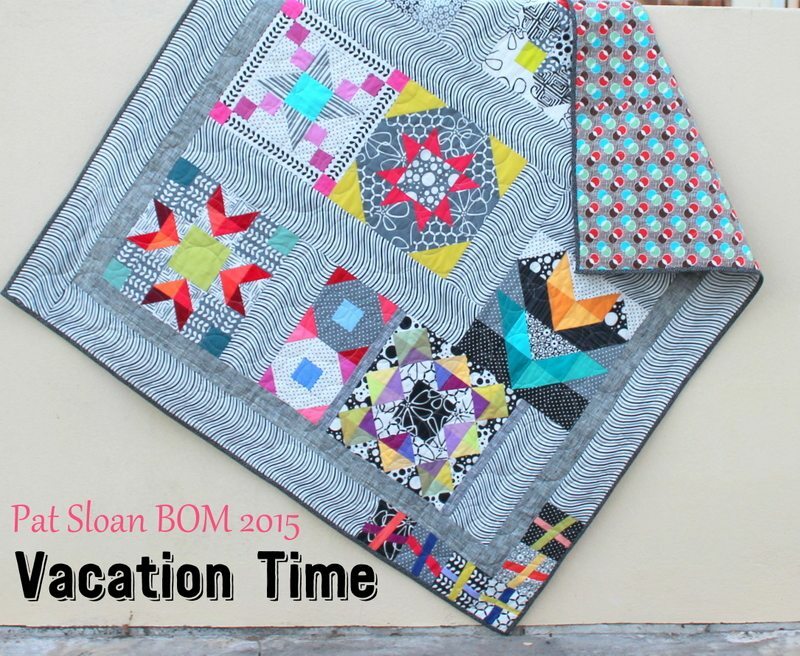 Don’t forget to add your blocks and final quilt to the InLinkz on each block post. Thank you Pat for another excellent sew along. Can’t wait to see what you have in store for us in 2016. Love that wavy print fabric!! 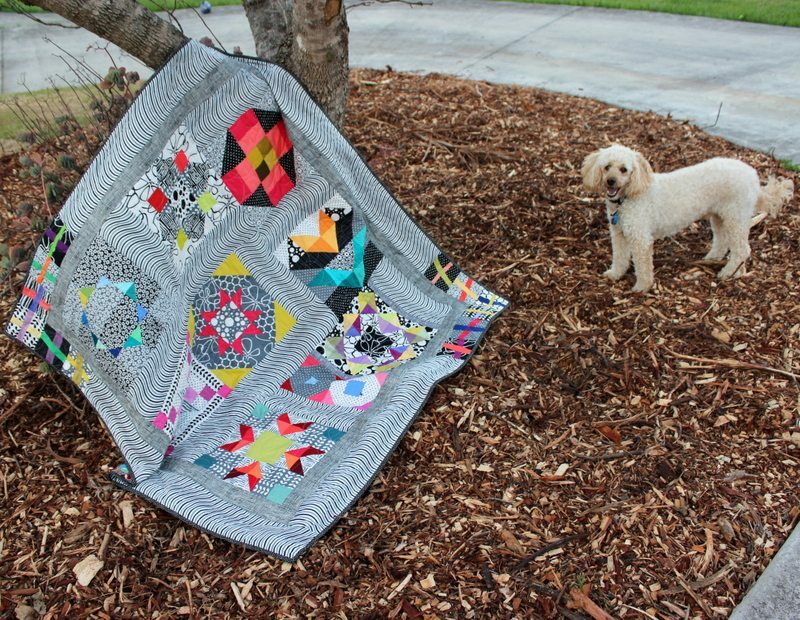 Also love the quilt! Thanks for sharing!! Thank you Sandra. The wavy print was fun to use. Very cool – it’s always fun to see different interpretations and creativity; I like the wavy print, good way to use it! Thanks Jen. That is what quilting is about. Creative interpretation.